Prodalim Group, the Israeli juice supplier and processor, is to double output at its new Brazilian citrus processing plant. The company formed a 50/50 joint venture with the Pereira family, who are well-known and appreciated citrus growers. Last year, the company opened the Gota Doce Agroindustrial Ltda factory. Gota Doce was built in Duartina, in the middle of the new São Paolo citrus belt, to guarantee a reliable raw material supply. 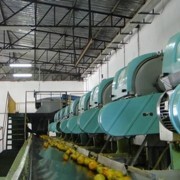 The plant is now in full production of FCOJ, both normal and low pulp, as well as lemon concentrate and orange and lemon oils. During the last crop, the factory produced 6,500 tonnes of FCOJ and essential oils, and the entire production was sold to leading bottlers in Europe. in the coming season, it will double its production to 13,000 tonnes of FCOJ and several hundred tonnes of lemon juice concentrate. The factory presently has nine FMC extractors and can handle about 4.5 million boxes of fruit annually, which translates to 18,000 tonnes of FCOJ and 650 tonnes of orange oil, and the infrastructure is capable of handling greater output. It has Kosher and HACCP certificates, is an SGF member and is in the process of obtaining Rainforest Alliance certification.